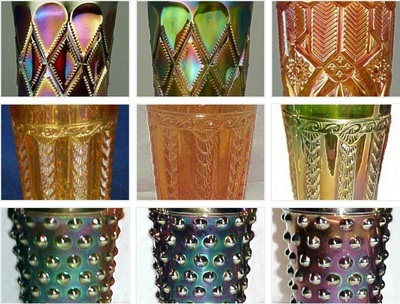 ​Welcome to the Classic / Vintage Tumbler Wing of Bob Smith's Carnival Glass Tumbler Museum. We hope you enjoy your visit. An entire world of Carnival Glass tumblers with many dating back to over a century ago, representative of countries far and wide, will be featured in this Wing. Classic USA tumblers form the greater part of the exhibits, and they include the rarest as well as the popular and accessible. Tumblers for Everyone – ranging from the kind of tumblers that are easily obtained, up to the rarest of the rare. 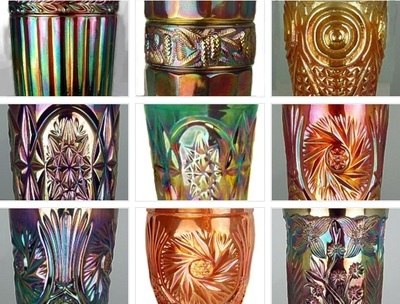 Displaying all Carnival tumbler producers in the USA, from around 1907 to around 1930. 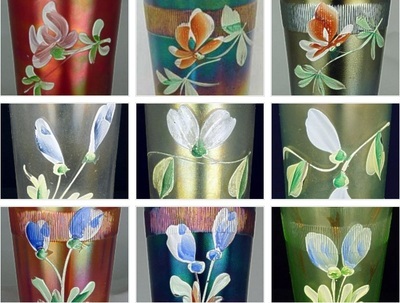 Displaying Carnival Glass enamelled and decorated tumblers. They are primarily from the USA, but other countries are also represented. They date from possibly the late 1800s through to around 1930. Displaying Carnival Glass tumblers from around the world, including India, Europe, Australia and South America, from around 1910 to around 1940. ​​We are busy setting up the Rooms with their various Exhibits and Displays, and they will be added to regularly. So please keep visiting the Museum! Take the Tour of Bob's Classic Carnival Rooms (click on any Room below).